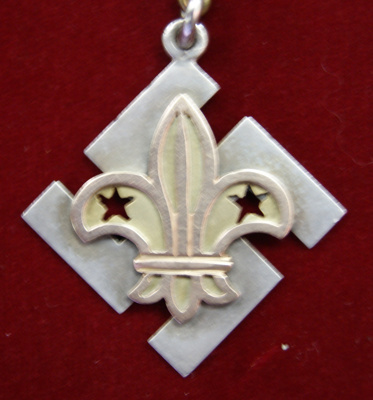 A purpose made "Thank You" badge modelled on the standard type normally available in Scouting of the Scout arrowhead on a hooked cross which was an old symbol pf peace. However, during the First World War years, getting supplies of material from Imperial Headquarters in London was difficult and so local alternatives were created. This example was made on behalf of the 1st Kelburn Scout Troop in Wellington and presented to their Scoutmaster N Robertson on occasion of his departure for the war. He had been drafted into the Wellington Rifles Regiment and left for Glasgow in November, 1917.